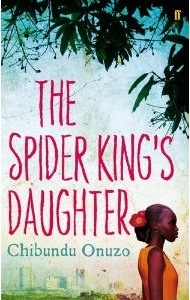 Chibundu Onuzo is defending the protagonist in her debut novel, The Spider King’s Daughter. She sits opposite me in an airy delicatessen in London Bridge, a fork dancing in her hand, her youthful face animated. She’s supposed to be eating a plate of mushroom pasta, but after I suggest her story of friendship across Nigeria’s economic lines cannot really be a friendship when the rich man’s daughter, Abike, insists on referring to the book’s other central character as The Hawker, denying him an identity beyond his poverty, Chibundu launches an earnest defence. “She was raised in a very unhappy home. I applaud Abike for all her humanity,” she insists. Chibundu is softly spoken and self-effacing. There can’t be many 21-year-old university students who find themselves juggling essay deadlines with promotion for a published novel, and there are certainly no others who can claim to be the youngest female writer ever signed by the venerated publishing house, Faber and Faber. It is a typical response from the young author, a mild self-depreciation used to counter any suggestion that her achievements are extraordinary. I’m not convinced. After all it must take a certain amount of focus and a prodigious amount of talent to secure an agent on the strength of three chapters then land yourself a two-book deal at 19. The subsequent two years of manuscript revisions were done alongside a history degree at King’s College, and now, in her final year she’s simultaneously working on her sophomore novel. Despite her amiable demeanour I imagine it must have taken some tenacious persuasion for her parents to agree to her history degree, a subject usually considered about as useful as horse husbandry by Nigerian parents. With her older siblings already working in law, finance and engineering, her parents, both doctors, probably decided three out of four was good enough. They likely also noted their youngest child’s ambitious streak – “I started my first novel when I was 10. I wrote 70 pages. When I was 14 I tried a short story collection.” – and realised it wouldn’t matter what she studied. After all, successful author is just another objective on a long list. Ultimately she’d like to work in politics or social development: “I haven’t decided if it would be more effective to work outside government…” not to mention the singing interest she’d also like to explore along the way. Chibundu first came to Britain to attend a private boarding school at 14, a familiar trajectory for the children of Nigeria’s upper classes. I ask about the issue of class and wealth in Nigeria, a theme that underpins her novel. Her seventeen-year-old creation Abike lives in a sprawling mansion, the favourite child of wealthy businessman, Mr Johnson, a man with his hands in every pie, (hence the title). On the opposite end of the spectrum is the young street hawker who one day sells Abike an ice cream, and changes the path of both their lives. Would these two really meet? Could they have a relationship in Lagos, a city where the gap between rich and poor is a yawning chasm? Her favourite childhood books? Interestingly she grew up with the same pool of imported Western classics as Nigerian children growing up in the 60s and 70s -The Famous Five, Mallory Towers and later Jane Eyre, Wuthering Heights, David Copperfield and The Count of Monte Cristo. Her eyes light up when she mentions Chinua Achebe’s Things Fall Apart, though she was only inspired to read it once she’d moved to Britain. “I just had this thought in my mind that Nigerian fiction would be very dull. I read it in one sitting. And I thought, ‘this book is amazing, I’ve been missing out.’” From there she discovered Chimamanda Ngozi Adichie and Sefi Atta. Chibundu joins a growing community of African writers being lauded on the international stage. Writers who, like Achebe did a generation ago, are telling African stories on their own terms. “When Ben Okri won the Booker prize in 1991…” she muses, getting the Booker year so dead-on I know she must have considered the prestigious award with her own name on it, “he must have felt a little lonely because he was one of very few African contemporary authors writing internationally. Now there are so many.” Indeed, so she can rest assured she won’t feel at all lonely when she gets hers.